The gloomy, foggy weather in Oslo on Friday was perhaps a fitting backdrop as Norwegian officials and mourners prepared to gather once again on International Holocaust Day. As consciousness of Norway’s direct involvement in the Holocaust continues to rise, the location for Friday’s memorial was the same as in recent years: the waterfront just below the walls of the Akershus Fortress, which was the site of Norway’s largest mass deportation of Jewish citizens during the Nazi German occupation. 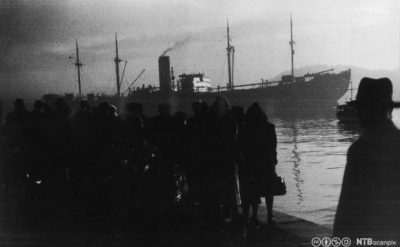 The deportation was memorialized in the only photo known to exist from the day that several historians now claim should be as important in Norway’s collective memory as April 9, 1940, when the country was invaded by Nazi Germany. 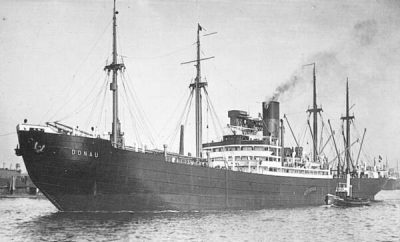 On November 26, 1942, Norwegian police delivered 532 Norwegians who also were Jewish to German authorities who loaded them on board the German transport ship Donau. They included 302 men, 188 women and 42 children, and all were shipped to Sczecin in German-occupied Poland. From there they were sent by train to the concentration camp Auschwitz Birkenau. Only nine men on board the Donau survived and returned to Norway after World War II. Newspaper Aftenposten, which first published the photo in 1994, reported that it was taken by Georg W Fossum for the Norwegian resistance movement. “He’d received a tip from police, who took part in the arrests (of those deported), that something was happening down by the harbour,” Harald Østgaard Lund, a photo historian for Norway’s Nasjonalbiblioteket (National Library), told Aftenposten. For years, though, Fossum’s film went undeveloped. He’d earlier sent film via a secret courier to neighbouring Sweden, which remained neutral and free during the war years, but his courier was revealed and Fossum lost that delivery channel. In 1994 Fossum responded to a call from Aftenposten for any photos of the deportation on Donau, which finally led to its publication 52 years later. 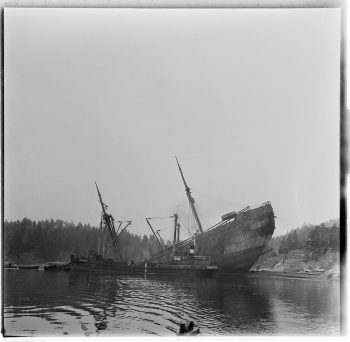 Fossum died shortly thereafter and the photo is now included in educational content provided by Norway’s National Digital Learning Arena (NDLA, external link), owned by Norwegian county councils. Today there’s an artistic monument to the deportation alongside the dock from which Donau sailed, and it’s where Norwegian government officials have met for memorial ceremonies, also on Holocaust Day. Prime ministers Jens Stoltenberg and Erna Solberg have spoken in past years, while this year Finance Minister Siv Jensen was due to speak at 3pm, along with Oslo Mayor Marianne Borgen. The ceremony, in which Norway’s Holocaust Center on Bygdøy was playing a key role, would be followed by a reception inside the fortress’ Fanehallen. Lund of the National Library and many other historians have noted, however, that the deportation and Norwegian complicity at the time was underreported for years. Norwegian history books barely mentioned it until Fossum’s photo turned up to document it. The deportation, Lund stressed to Aftenposten, involved the arrests and deportation “of completely innocent people, and they were sent to their deaths days later.” He said the majority were sent to the gas chambers at Auschwitz on December 1, 1942. Yet another 26 Norwegians who were Jewish were deported the same day, on board the ship Monte Rosa. All told, 767 Jewish citizens were sent to German concentration camps during the war years, and only 30 survived. The Donau, meanwhile, was ultimately bombed and sunk by Norwegian resistance forces in January 1945 and its ship’s bell has been on exhibit at the Holocaust Center, which itself has received funding from the state as part of compensation to Jewish citizens who lost everything during the war, also their lives. More historians, authors and even filmmakers have been delving into Norway’s deportation history. Nina Grünfeld, whose father Berthold fled the arrests and made it to safety in Sweden, has also been among those documenting the pre-dawn arrests and deportation in 1942. Newspaper Dagsavisen reported recently how she’s now fighting both anti-Semitism and phobia against Islam, in the form of three films and documentaries and even a jewelry project, through bracelets decorated with a Jewish Star of David, an Islamic hilal-half moon and a Christian cross. On Friday, historian Bjarte Bruland was due to speak at the Holocaust Day reception about the last major deportation on the vessel Gotenland, which sailed from Oslo on February 25, 1943 with 158 Jewish citizens on board. Most of them, Bruland told Dagsavisen, came from Central and Northern Norway, and were sent to Oslo too late to sail on the Donau. Bruland is also working on what he hopes will be the “standard” historic compilation of information about Norway’s participation in the Holocaust. It’s due out this spring. International Holocaust Day on January 27, the day Soviet forces liberated Auschwitz in 1945, was also being marked elsewhere around Norway. Guri Hjeltnes, the journalist and historian who is director of the Holocaust Center in Oslo, has led the memorials and notes that they’ve grown in scope and meaning every year. She cited more extensive research of the Holocaust in Norway and rising consciousness of Norway’s involvement. “Now people are lining up to take part, both politicians, diplomats and other authorities,” Hjeltnes told Dagsavisen on Friday. Representatives of 30 embassies in Oslo were among those due to attend Friday’s memorial.